The Genold Front Pocket Washed Shoulder Bag is a stylish and economically priced bag for casual outings when you want to keep all your essentials handy. This modern design is well equipped with organized storage, plenty of room for your cell phone, wallet, makeup and toiletries with enough space left for almost any tablet. Inspired by European culture, Genold has been committed to produce vintage and functional designed bags for both men and women. We will continue to be in the pursuit and insistence of perfectionism and modern craftsmanship by making the best bags and pleasant customer experience for you. MATERIAL. 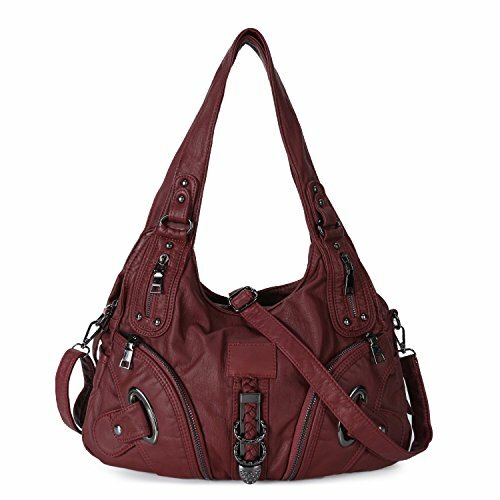 Soft washed synthetic faux leather features with high quality silver tone hardware and smooth zippers. DIMENSIONS: 13.8*10.6*3 inches (L * H * W ). WEIGHT: 1.5lb. Handles: 22.5", Long Straps: 39.3". This versatile leather hobo purse can comfortably carry your daily items such as iPad, iPad Mini, 12" laptop or other tablet not heavy and bulky at all. STRUCTURE: Interior features 2 main compartments and closed with zipper, one with 2 slip pockets, the other with 1 small zipper pocket. Exterior: 2 front zipper pockets, 2 side pockets and 1 back zipper pocket. Various roomy pockets handbag keeping all of your stuff organized, fits your makeups, umbrella, cellphone, wallet and kids stuff such as diapers and wipes etc. CONVERTIBLE STYLE. With adjustable additional attachable shoulder strap, this tote bag can be transferred into handbag and shoulder purse, very creative and functional. CLASSIC CHIC DESIGN. Decorated with rounded rivet makes it look more stylish, this soft leather handbag will match your everyday clothes perfectly, suitable for office lady, traveling, business meeting and shopping everyday use. If you have any questions about this product by Genold, contact us by completing and submitting the form below. If you are looking for a specif part number, please include it with your message.